I super-love pumpkin recipes. Super. I know it isn’t a major favorite of everyone out there–my dad doesn’t think vegetables should be mixed with desserts, but I love them! And as against pumpkin dessert recipes as my dad is, he even concedes the ones I am sharing with you today are delicious. And you really need several ideas because if you open a big can of pumpkin, you will need several recipes to use it all up! 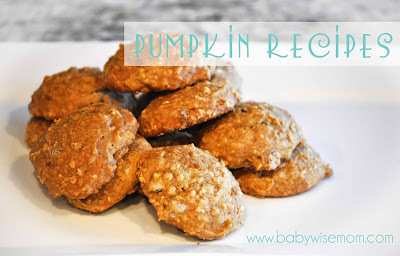 This is the best pumpkin cookie recipe! I took these to my Sunday School class full of 16 year old boys and they were gushing over how good they were–this is significant because 16 year old boys usually just eat without commenting on flavor. It also makes a ton–I get 5-6 dozen out of this recipe. That is enough to take treats around to your neighbors! Add wet ingredients to dry ingredients. Mix together. (When I make this, I just throw it all into my Bosche at once and let it mix it up). Mix ingredients together and then eat! Whisk ingredients together and heat in a saucepan. And by the way, the regular alfredo sauce recipe linked in that recipe is AMAZING. Do you have a pumpkin recipe you love? Please share!